The Annabel Croft Tennis Academy at the Intercontinental Aphrodite Hills resort near Paphos has nine floodlit courts and a team of coaches to teach all ages and abilities (annabelcrofttennis.com). The resort also has an 18-hole golf course and a superb spa. A week’s half board costs from £1,199 per person, including flights, through Sovereign Luxury Travel (0844 415 1984; sovereign.com).
. Sea breezes rustle the palm trees above and when you’ve had enough tennis, the sea is within two minutes’ walking distance for swimming, kayaking, sailing, or snorkelling on the nearby reef. 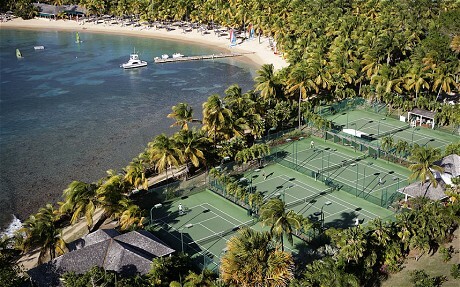 The all-inclusive resort has a team of coaches, supplemented by big-name players for its regular tennis weeks in April, May and November. This autumn, a tennis and wellbeing week, hosted by Annabel Croft and Andrew Castle, runs from November 15 to 22, costing from £3,349 per person booked through Caribtours (020 7751 0660; caribtours.co.uk). The price includes all meals and bar drinks, watersports, yoga, water aerobics, tennis-week activities, flights and transfers. Also included are a cookery lesson, a spa treatment and a sailing trip to English Harbour, Nelson’s historic dockyard. The new sports complex near the Sani Beach Hotel features six floodlit clay courts where guests can book coaching sessions, hire equipment and play in holiday tournaments. 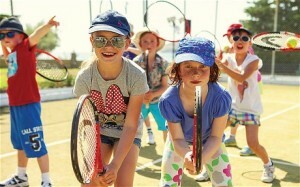 Family tennis packages include teen programme sessions and a kids camp. Sovereign Luxury Holidays (sovereign.com) has seven nights half from £1,579 for a family of three in a garden view bungalow at the Sani Beach Club, including flights, transfers and complimentary upgrade to full board. Tennis is a popular activity at La Garangeoire campsite, between Nantes and La Rochelle in western France. 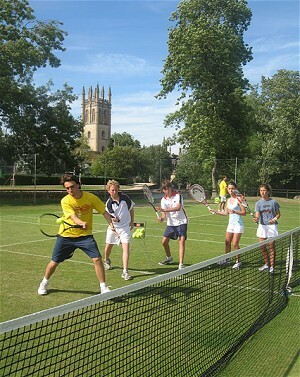 There are two tennis courts and individual and group lessons are organised in high season, with weekly tournaments. Courts can be hired for 6.50 euros an hour during summer holidays, and are free in April, May, June and September. Other activities on site include archery, soccer training, canoeing, angling and mountain biking. From 246.50 euros a week for a pitch in late August, or 413 euros for a two-bedroom chalet. Lodge and mobile home accommodation is also available (camping-la-garangeoire.com). The site is part of the Les Castels group, a collection of 41 four- and five-star camping sites around France, many of which have tennis courts for the use of visitors (camping-castels.co.uk). Mark Warner has tennis courts at its seven beach resorts, and coaching staff on hand to teach adults and children. Courts are free to use, and loan of racquets and balls is also included in the holiday cost. Academy courses for players wanting to improve their game run throughout the summer at Lakitira Resort in Kos and Levante Beach in Rhodes. They cost £125 per person, in addition to the holiday cost, and include four 90-minute lessons, one private lesson, a speciality shot clinic of ball machine session and a faults and fix list. 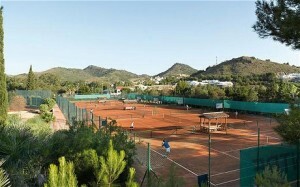 Intensive Tennis Weeks, with LTA qualified instructors providing 20 hours of tuition, will run at both resorts from September 20 at Levante, and from October 4 at Lakitira in Kos, costing from £200 per person in addition to the holiday price (from £495 per person in October, including meals and flights; markwarner.co.uk). 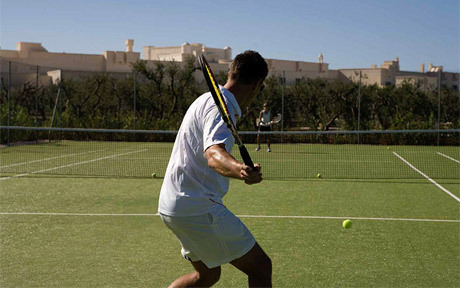 There are four well-maintained courts at Borgo Egnazia resort (below) on the coast of Puglia, where the Sunball Tennis School organises group and private coaching and weekly tournaments for adults and children. The resort has several swimming pools, an excellent spa and an 18-hole golf course. A seven-night stay costs from £1,745 per person in a sea-view room in the hotel, booked through Red Savannah (redsavannah.com). This includes return flights and private transfers. Roger Walker Travel is a specialist travel agent organising tennis holidays for groups, families and individuals across Europe. Their two most popular destinations are La Manga Club in Spain and Val do Lobo in Portugal, both with a range of accommodation options, countless, immaculate tennis courts and teams of instructors on hand. A week at La Manga in mid September costs from £850 per person in a one-bedroom apartment, including flights, transfers and a muscle-burning 25 hours of tennis (tennisholidays.co.uk). Tailor-made trips to other resorts are also available, and Roger Walker even organises tennis weddings. Jonathan Markson runs tennis camps in Oxford, London and Yorkshire and tennis holidays in Europe and in Florida, Mauritius and Tunisia. The UK based residential camps offer up to 30 hours of tennis over six days, as well as video analysis and tournament play. The weeks are sociable affairs, and include organised evening events. The Oxford summer camps, which include accommodation in a university college and all meals, run until the end of August and cost from £995 per person for a week (marksontennis.com). There are four tennis courts and two squash courts at Los Jameos Playa resort in Lanzarote, where Peter Burwash International runs tennis camps, junior coaching sessions and holiday tournaments for guests. “Xavier Guyot, the director of tennis, will tell you to fling your racket over the net, or serve blindfolded” writes Simon Briggs, the Telegraph’s Tennis Correspondent. “He is constantly demanding the perfect “connection” with the ball… an unusual approach that seems to work, judging by the sense of perpetual motion on the four courts.” A week’s stay costs from £781 per person, half board in September with Classic Collection, including flights and transfers (classic-collection.co.uk). Court rental is 9 euros an hour, individual lessons are 42 euros an hour and courses cost from 150 euros for three days. To book tennis courses or lessons call 00 34 928 511 717 or email xavier.guyot@pbitennis.com. Copyright © 2019 Belvicci. All rights reserved.